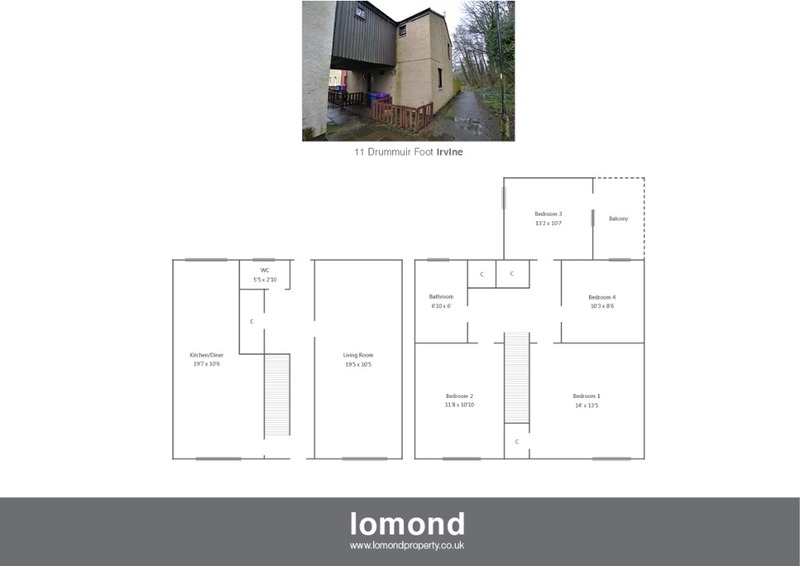 11 Drummuir Foot is situated in the ever popular Girdle Toll area of Irvine, with four bedrooms, downstairs WC, spacious living room, and striking kitchen/diner this property is sure to appeal to those seeking excellent family size accommodation. In summary the property layout extends to a spacious and welcoming hallway with downstairs WC and stairs rising to the upper level. The living room stretches the entire length of the house with patio doors leading to the rear garden. The kitchen/diner is striking, with newly fitted flooring, with wall mounted units, LED plinth lighting, and an eight ring gas cooker. The upper level is accessed from the stairs off the main hallway, and houses four bedrooms, three of which are doubles and a family bathroom. Bedroom 1 has fitted cupboard space. Bedroom 2 has patio doors leading to the balcony. The family bathroom is well presented with Jacuzzi bath, electric shower, WC and WHB. Externally the property has gardens to the front and rear. To the front there is a small section of garden laid to decorative chips with perimeter fencing. To the rear the garden is south facing, laid to patio slabbing, and perimeter fencing. Drummuir Foot is a pleasant residential area. Irvine town is close by and provides access to a range of amenities including supermarkets, bars, restaurants and town centre shopping. There are a number of local primary and secondary schools within the greater Irvine area. From our office on Bank Street, heading away from the town centre take the 4th exit off the Stanecastle roundabout, and continue forward onto Middleton Road. Take the 3rd on your left onto Bowhouse Rise, then left again onto Drummuir Foot. Number 11 is at the end on your left.